Apple’s larger iPad Pro has been picking up the pace when it comes to rumors and leaks these days. The iPad Pro is expected to come with a screen size between 12 – 12.9 inches, surround sound speakers and will be Apple’s first attempt at a larger screen tablet. The device will also be an attempt by the Cupertino manufacturer to boost iPad sales, which have declined over the past couple of years. An image appeared on China’s social networking site Weibo today, simply titled as the ‘iPad Pro‘. 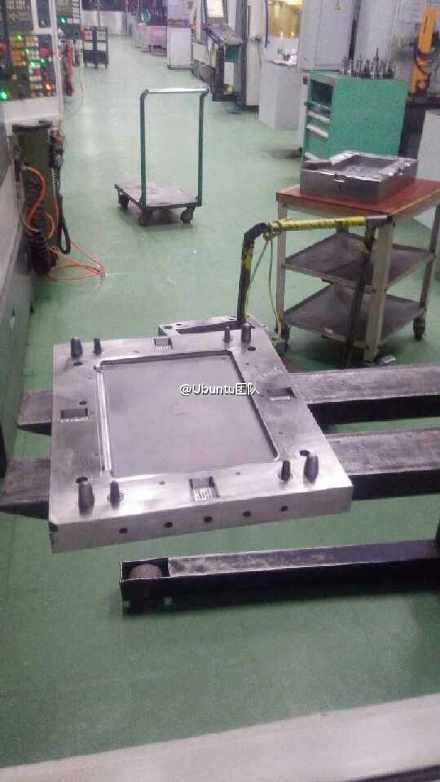 New Leaked Image Appears To Show The Manufacturing Case For Apple’s iPad Pro. As you can see, the image above shows what appears to be the mold casing for Apple’s iPad Pro. Little information can be taken away by simply taking a look at it, but one can nevertheless learn a little bit about the device. Firstly, as also expected by earlier leaked schematics of the iPad Pro, the mould shows what appears to be another thin device from Apple. The size of the mold also indicates a much larger iPad in the works than current devices found in Apple’s linuep. Also, if you look closely at the image, you’ll see what appears to be an Apple logo right at the center which does end up lending more credibility to the image. Apple’s supply chain became notorious for its leaks after all last year, when we came to know almost everything about the iPhone 6 and the iPhone 6 Plus prior to their launch in September. The one major question that remains now is when will Apple officially announce plans for the iPad Pro, if the device even exists. The rumor mill would certainly like us to believe that, and by the rate of things proceeding in the tablet industry, the time would also be just right for a larger screened tablet from Apple. So stay tuned, we’ll keep you updated on the iPad Pro and let us know what you think in the comments section.